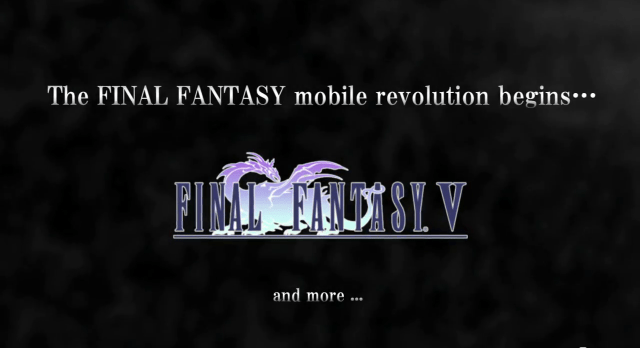 The Final Fantasy Mobile Revolution Begins – Is a Final Fantasy V Remake Coming to iOS? Many fans wondered why Square-Enix stopped remaking Final Fantasy games on the DS platform after Final Fantasy IV. Many wondered when remakes of Final Fantasy V or VI were coming. For those of you who are unaware, the Final Fantasy IV you’ve probably played on your DS or PSP is available now on mobile platforms. Something noteworthy that immediately took the attention of our staff away from news of “another iOS port from Square-Enix” was this teaser image that appears at the end of the video linked above. What could this possibly mean? Clearly, Final Fantasy V is headed for mobile platforms. But could it be a remake similar to the version of Final Fantasy IV advertised in the trailer? Does the “and more” hint at long-awaited remakes of Final Fantasy VI or Final Fantasy VII happening…but built exclusively for mobile platforms? Nothing is currently known about this image. We’ll keep you all informed as further news develops. How does this news/speculation make some of you feel? A lot of our staff, myself included, may have quite a bit to say in the future depending on how this situation develops.